The year is 1625 and 18 year old D’Artagnan de Beaugency is leaving home, his head filled with thoughts of honour and glory, with hopes of becoming a musketeer. Based on the classic novel by Alexandre Dumas and adapted for the stage by Tony and Olivier award winning playwright Ken Ludwig, The Three Musketeers is the Nanaimo Theatre Group’s season opener. Ludwig describes the 750 page novel as “like reading the best and longest comic book in the world” and his adaptation for the theatre has retained this sense of playful good fun. Although the script is fast paced and very funny the underlying themes of the play couldn’t be more serious - life, death, love, hatred, honour and betrayal. Needless to say the play is significantly shorter than the novel but Ludwig has managed to capture the essence of the story and the spirit of the writing. 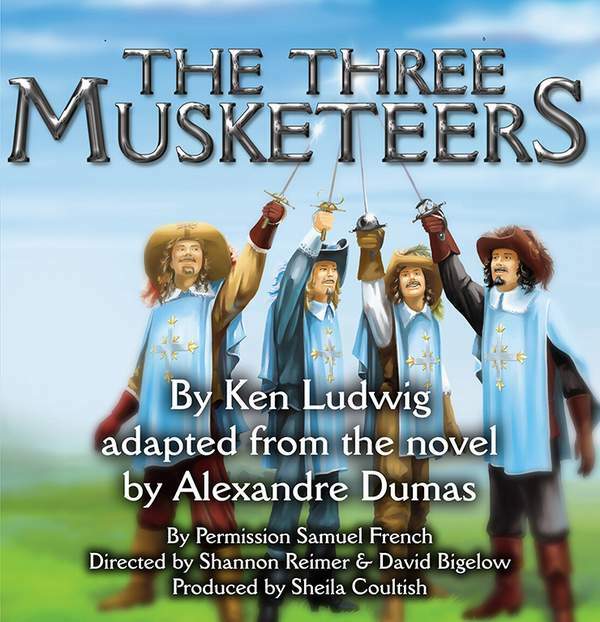 All of the well-known characters such as D’Artagnan, Athos, Porthos, Aramis, Milady and Cardinal Richelieu play a central role in the stage production but Ludwig also added a new character, D’Artagnan’s sister Sabine. One of the main challenges of mounting a production of this nature is the vast amount of physical theatre demanded by the script. Besides the obvious need sword play there is kicking, biting, stabbing, punching and all other manners of stage combat. The actors and directors have been working diligently with fight coordinator Chris Buechler since early July to bring all of this action to life. The Nanaimo production is co-directed by Shannon Reimer and David Bigelow, produced by Sheila Coultish and stars James Dean, Scott Britney, Jimmy Kwas, Daniel Kingshott, Sheridan Collyer-Valens, Derek Carter and Sarah Thomson. Audience members can expect a lively and entertaining production that will make them laugh out loud and possibly shed a tear. While adults can fully expect to enjoy this show, it also offers a great opportunity to introduce teenagers to the magic of theatre. For more information and to order tickets check out the new website or call 250-758-7224. The play opens Oct. 15 at the Bailey Studio, 2373 Rosstown Road, and runs Wednesdays to Sundays until Oct. 31 with the most affordable prices in town, $18 Wednesday, Thursday and Sunday, $20 Friday and Saturday.